In my last post, I revealed the secret to effective subplots. Here I unveil the most important type of subplot. To illustrate this critical subplot, I’m going to use examples from Tootsie. Why? Because I can’t think of a screenplay that makes better use of subplots than this 1982 comedy classic. The central narrative of Tootsie – the “throughline” – is about an unemployable actor, Michael Dorsey, trying to maintain the pretence that he is Dorothy Michaels, one of America’s favourite “daytime” actresses. This is his “want”. To make life difficult for Michael, the writers introduce several highly effective subplots – story lines that cause serious complications for the hero in the pursuit of this “want”. These are all great subplots because they all make it harder for Michael to maintain his duplicitous life and collectively they escalate the drama to a mad frenzy by the end of Act 2. But one of the subplots does something more than just complicate the quest. It makes him question his want entirely. That’s the subplot involving Julie (Jessica Lange). This is the subplot that’s absolutely critical to the story and it’s what I call the “need” subplot. In a screenplay teeming with subplots, the one that ultimately causes Michael Dorsey (Dustin Hoffman) to question his want is his relationship with Julie (Jessica Lange). In Tootsie, Michael’s overbearing want is this desire to be an actor. As usual, the protagonist’s want is all about external achievement. It’s about the ego. But that’s not what he really needs. What he really needs is love. What he really needs is Julie. In fact, while his want is to act, his need is to stop acting and get real. Unfortunately for Michael, he can’t be Dorothy, successful actress, and have Julie. In order to get what he needs he’s going to have to give up what he wants and go back to being unemployable Michael Dorsey. That’s the dilemma he’s faced with at the Act 2 Turning Point: want vs need. At the Act 3 climax, he opts for giving himself a chance with Julie and reveals his true identity live on national television. He chooses need over want, showing us he’s changed, and earning his spurs as a narrative hero. But it’s this final element, the need subplot, that can be so helpful in setting up for a dramatic and emotionally powerful conclusion. Why? Because it lets you present your hero with a dilemma at the Act 2 Turning Point. Will they choose to continue pursuing their want? Or will they sacrifice their want in order to access the more interior pleasures of their need? If they choose their want, they show they haven’t changed – and that’s what will happen in a tragedy. If they opt for their need, they prove to us that they are altered and qualify as a “hero” in the narrative context. They might not win the “prize” but they’ll gain the more enduring pleasures of the interior. Since it’s about fulfilment, the need subplot is almost – but not always – about love. Let’s look at how some great films have used the need subplot to create a dilemma for the protagonist and set up for a powerful conclusion. In North by Northwest, Roger Thornhill (Cary Grant) is mistaken for George Kaplan, a man who is in very grave danger of being killed by bad guy, Phillip Vandamm (James Mason). Thornhill’s want is to sort out this misunderstanding before he gets killed – a not unreasonable want. But that want is complicated by the fact that Thornhill meets Eve Kendall (Eva Marie Saint) while hiding on a train. Initially, he falls for her, then he believes her to be Vandamm’s moll before finally learning that she’s working for the good guys and will die – if he walks away. 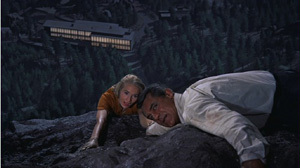 The need subplot that forces Roger Thornhill (Cary Grant) to question his want is his relationship with Eve Kendall (Eva Marie Saint) – which reaches its conclusion on Mt Rushmore. From the inciting incident in Act 1, all Thornhill has wanted to do is get the hell out of this mess and go back to his selfish life as an advertising man and Mummy’s boy. But now he has a dilemma. Get your selfish want, and the woman you love will die – thereby denying you what you need: love. Cue Act 2 Crisis. At the Act 3 Climax, Thornhill turns his back on his want and memorably rescues his need on the sculpted President’s faces of Mt Rushmore. Social Network too sets up this tension between want and need. Mark Zuckerberg desires to be rich and famous – and creates Facebook to achieve that external want. But his need is love – in the specific form of Erica Allbright. The film’s tragic power in that final scene comes from the fact that he gets his want – beyond his wildest dreams – yet his need is still out of reach, because, at a character level, he’s failed to grow. As I noted in an earlier post, this screenplay, for all its verbal brilliance, would have fallen in a heap without this one critical subplot. The need subplot. In films involving a love triangle, the want and the need are both potential romantic partners. Look at Bridget Jones’s Diary, for example. The throughline is that Bridget (Renee Zellwegger) wants bad boy boss Daniel Cleaver (Hugh Grant). That’s an external desire because Daniel represents what every young woman is meant to aspire to: a guy who’s handsome, successful, witty and charming. That’s her want. Bridget Jones has to choose between her dishy want, Daniel Cleaver (Hugh Grant) and her more substantial need, Mark Darcy (Colin Firth). 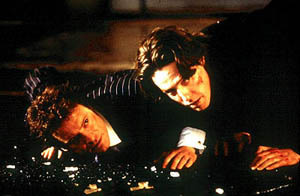 But then there is the subplot with family friend, Mark Darcy (Colin Firth). He’s not as dishy but he offers more satisfying pleasures. Daniel offers “achievement” while Mr Darcy offers fulfilment. The film is about Bridget struggling to overcome her desire to have what she wants and realise what she really needs. But the need subplot doesn’t have to be about romantic love. It can be about friendship. In An Officer and a Gentleman, Zack (Richard Gere) has a relationship with Paula (Debra Winger) but this isn’t the subplot that drives a wedge between want and need. At no point in the story does he have to choose between graduating from aviator school and having Paula. That dilemma is created by his friendship with fellow aviator candidate Sid Worley (David Keith). The need subplot in An Officer and a Gentleman is not the romance with Paula (Debra Winger), but the friendship with Sid Worley (David Keith). So when Sid is duped by a “Puget Sound Deb” and commits suicide, Zack feels – rightly or wrongly – that Foley is partially to blame. So he challenges him to a martial arts duel. If he wants to achieve his want and graduate, this is not a smart thing to do. But he does it because his need – the love of his buddy – has overpowered his want, telling us he’s been altered for all time. Another type of need subplot is where the love exists not with a lover or a friend but within the family. In Little Miss Sunshine, almost all of the characters have external objectives that are all about “want”. Richard (Greg Kinnear) wants to have his “9 Step Refuse to Lose” program published. Frank (Steve Carrel) wants to be America’s pre-eminent Proust scholar. Dwayne (Paul Dano) wants to be a jet pilot. And Olive (Abigail Breslin) wants to be Little Miss Sunshine. In Little Sunshine, Olive’s outrageous dance is the act that finally releases her dysfunctional family from their wants and lets them embrace their need – love. But what this highly dysfunctional family really needs is love. When Richard is asked to remove Olive from the stage at the finale, but refuses and instead joins her in dancing to Chic’s “Le Freak”, he shows us fulfilment beats achievement every time. They have all failed in their external goals, but the family is whole again. I said that the need subplot was almost always about love. One exception I can think of is where it’s about self-expression. In Baz Luhrmann’s first (and best) film, Strictly Ballroom, the protagonist Scott (Paul Mercurio) has a desperate desire to win the Pan Pacific ballroom championships. That’s his want. As usual, it’s about exterior achievement. The ego. While there is some romance with his dancing partner, Fran (Tara Morice), Scott’s need isn’t love. The story is not going to force him to choose between his desire for the championship and his love of Fran. It presents him with a different sort of dilemma. The need subplot here is the discovery of a different, more passionate form of dancing that lets Scott truly be himself for the first time. This is his need. In Strictly Ballroom, Scott’s need is not love but to have the courage to dance his own steps. As human beings, we often lose sight of what’s really important. We think it’s about getting the prize and having the toys, despite experience telling us that life’s great joys are internal rather than external. A great transformative story reminds us of this eternal truth. How do you do that? With a subplot that offers your protagonist what they need – but that requires them to give up on their illusory want. That’s a good question, Ivan. One problem I would think when both want and need are internal is that it would make it very hard to show character growth. If at the start of the journey their want is about fulfilment rather than achievement, how do you show they are altered by the journey? But something like The Godfather is interesting. Michael’s (Al Pacino’s) want at the start of the film is to have a relationship with Kay (Diane Keaton). But, that’s internal. It’s about fulfilment. So it’s really a need. He’s then asked to step in and run the family and do things that are contrary to his moral code. So you could say that his want is to keep the family afloat and his need is Diane Keaton so he has go in the opposite direction: from need to want, making it a tragedy. But, at the same time, because he’s not doing it for himself – he’s doing it for family – which is about fulfilment – however ugly the means. So it’s possible that he starts with one need but he is then forced to honour another need which is contrary. One thing I would be concerned about with a want and a need that are both interior is that there is still something external driving the action. It’s very hard for a character to want inner peace, for example. What does that look like? What concrete action do they need to take? The point about giving a character an exterior want is that it generally makes it much easier to dramatise – to SHOW on the screen. Novels can get away with interior goals much better than films. Very interested to hear if anyone else has some thoughts on this. This is a great post. I found it very useful in particular when I answered (or tried to) the 3 narrative elements in relation to my protagonist’s journey. It was difficult answering the second element. Thanks, Nadi. The goal is to have a story that is dramatic and that escalates throughout its length. The most straightforward way to do that is through the obstacles, tests and threshold guardians that the protagonist encounters on the throughline. Raiders for example doesn’t have a lot of subplots that complicate the main narrative. It’s him chasing the ark against Belloch and the Nazis, with the sole subplot being his relationship with Marion. (And that’s a need subplot). And Raiders doesn’t ask him to choose between want and need – it compounds them to raise the stakes, since we’re not looking for Indiana Jones to transform. But that’s an action film and a pretty extraordinary action film. Most screenplays are going to benefit from subplots that complicate the throughline. Just stumbled onto this blog for the first time – thought provoking post. Definitely bookmark worthy. Anyway, I’m currently rewriting a script that was a very internally driven story, and really boring at that. I’m trying to externalize the wants. I hadn’t really thought about sub plots this way, and I’m realizing that the story is sort of inside-out – and that intrigues me. By inside-out I mean that this character’s need is actually more external and his want internal – love isn’t what he needs, but what he wants. The only film that comes to mind is 500 Days of summer, but I’m interested in whether anyone has any opinions on this. Thanks! Any chance we can download your pages in PDF format? I find your advice really interesting to read and use it to review my own work. But I dont want to have to always be connected to the internet to read them. p.s any plans on starting a pod cast? I think you’ll find you can now download all the articles on the site as PDFs – there’s a link in the sidebar and one at the bottom of the article. Thanks for the suggestion. No, I don’t have any plans to podcast as yet I’m afraid. But I am considering doing some video stuff. I just stumbled upon this site yesterday. I just want to say Thankyou. Sincerely. Even Syd Field, who I consider the Guru amongst screenwriting teachers, was vague on the subject. I have learnt more from your site in the last 24 hours than I have learnt in a couple of years from assorted books, etc. The above article on Subplots, in particular, was sensationally helpful in relation to not only subplots, but to the mysteriously and usually avoided Character Arcs, and provided an abundance of ‘Aha’ moments. Keep up the impeccable work, and it’s so nice to know that an Australian is at the keyboard of this fine website. I just discovered this site today and I’m really enjoying it. I had an observation about the ‘Self-Expression” subplot: I think it’s just as much a love subplot as the others. It’s just that, instead of choosing love for another person/group of people, the protagonist is learning to love himself/herself. Just a thought! Thanks again for the site. I’m learning a lot. Yes, I guess that’s one way of looking at it. The warning I would have about this is that this self-love needs to be externalised in some way. If you’re expecting the audience to sense they love themselves without getting them to do something, it’s not going to work the emotions. I just discovered your site and love what you have to teach young writers like myself. I’m currently working on my first screenplay and regarding want vs. need, I’ve realized my hero’s want is not about external achievement, which poses a few issues. In working it out I’ve realized that her want can be external if I put it in terms of her wanting to turn 18 (she’s 17), which will change the circumstances of her situation. So, I guess what I’m asking is can something inevitable (such as growing up) be an external want? The important thing to remember about the Want is that it’s there to create conflict and set up a chain of events that can escalate the conflict. On the face of it, it’s not immediately obvious to me how the goal of turning 18 could set up that conflict. Having said that, in Juno the Want is to adopt out the child when it’s born – which doesn’t require her to do anything in Act 2. It’s just an overarching narrative. What creates the conflict are the subplots – mainly her relationships with the intended adoptive father Mark and the biological father Bleeker. Both of these subplots create doubt about the Want and both of them escalate. So the drama works. We engage because we like Bleeker and want to see whether they end up together, and we engage because we want to see whether the flirting with Mark goes beyond that. Also, critically, both subplots tease us around the dramatic question, Will Juno adopt out her child to Mark and Vanessa? I recently consulted on a script where the writer, in responding to a note from another analyst that their character had to have a Want, superimposed a goal that didn’t fit the story. I pointed out that there were objectives the character could have within the existing story that could create the necessary conflict, and again they were around relationships. The only rule is don’t be boring. Conflict and escalation of that conflict are effective guards against boredom. Do you have conflict (external) and does it escalate? If so, then you’re fine. If not, then you could be in trouble. Thanks so much! I’m going to work on it. I’d love to sign up for your mailing list, but I can’t seem to do that without tying in my facebook account. Facebook is intrusive enough, so I’ll have to pass. If you don’t want to go via your Facebook account, you just need to logout of your Facebook account while you sign up to the mailing list.